That was an important distinction for Jerome Allen to make in his final press conference as Penn’s head coach, and the dichotomous night provided all the evidence one needed to believe the statement came from Allen’s heart. During pregame warm ups for their contest against Princeton on Tuesday, Allen’s players came out not in Penn gear, but in black t-shirts. The players returned to the locker room, and when they came back out, they had changed from blank black shirts to navy blue ones – Penn blue – with the number 53 (Allen’s number when he played for Penn) on the back of each one. It was both a statement of disapproval and celebration, but one thing was clear. In the players’ eyes that evening, it wasn’t so much about putting on the Penn uniform, as Allen always claimed should be their motivation, but rather playing their last game for a man who ultimately would have a bigger impact on their lives than having worn the Red and Blue. Such a statement did not stem from the players loving what Allen did as their coach, but what he had done for them as men. Yes, Allen is not yet defined by what he does. Coaches only become defined by their work when the wins start to pile up. And that never happened for Allen during his tenure as Penn’s coach. He is, as he reflected, a better coach than he was when he took the reigns following Glen Miller’s tumultuous reign, but he never flourished as a coach at Penn. The numbers, which have been turned over and over again these last five days, tell that tale. The numbers told the story of the game on the court on Tuesday night as well, the most important of which being 11:30, the time it took Penn to score in the second half, during which time Princeton blew the contest open. Turnovers were made, shots were missed, and battles for rebounds were lost. In his five and a half years, he may not have become a good enough coach to lead his players to three emotional victories in five days, or to figure out how to get his team to stop coughing up the rock as much as it did. No, Allen is not defined by what he does. He is defined by who he is, and that is a man who is gracious, selfless and arguably most importantly, so very thankful. He took a team that had a venomous aura and slowly but surely turned it around, to the point that his players felt the need to protest his resignation on his last night as their coach. Wins and losses be damned, he worked hard to make sure that his players were not only becoming better basketball players, but also better people. Allen didn’t have the easiest time as mayor of the Palestra. He read the message boards and the papers. He knew of rumblings among the administration and the alumni about his job security. Even though he wasn’t always able to keep his cool, he took the criticism, even when it should have been placed on the players. His main job, besides winning games, was protecting his players, building a team that was also a family. And he did that, night in and night out, for five and a half years. What Allen is striving for is a road less traveled, but it’s one that all the best people, the ones who make the biggest impact on the lives of those around him, take. Rather than allowing his work to define him, he is laying the groundwork for allowing who he is to define what he does. Some day soon, Penn basketball will cut the nets down at the Palestra, and the program will have Allen, in part, to thank. His infusion of players with the right character will go much farther than wins and losses. And some day soon, Allen will coach again, and slowly but surely, who he is – his grace, his selflessness, his appreciation for the opportunities provided to him – will seep into the win column. 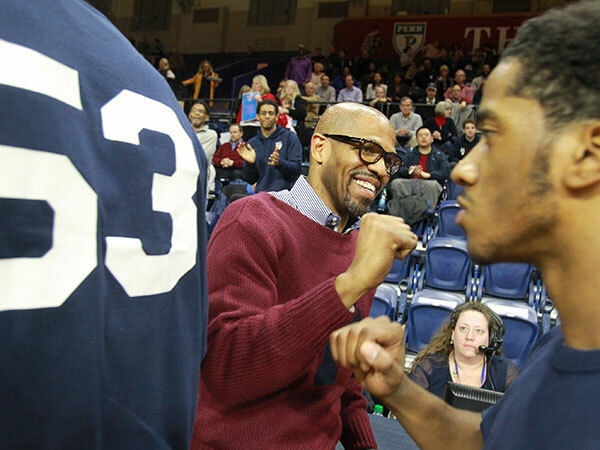 Despite the score on the scoreboard at the Palestra on Tuesday, Allen enters into his next season on a winning streak. class piece for a class guy. I wish everyone could have seen him fly.